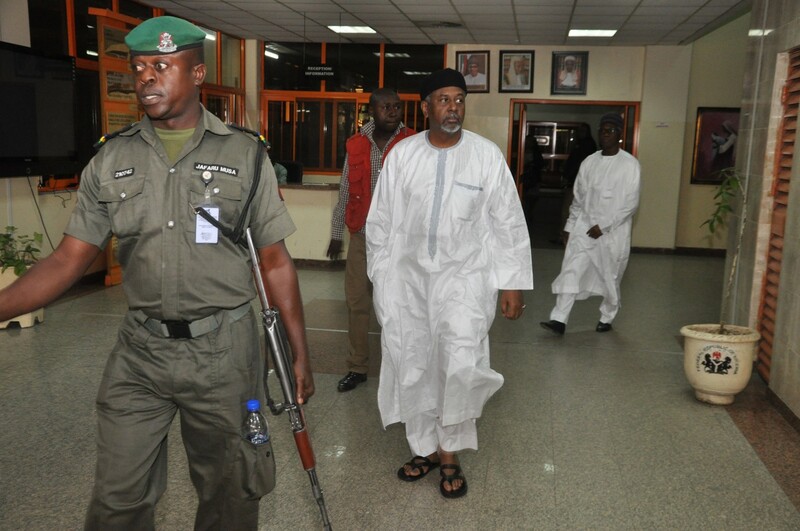 Embattled former National Security Adviser, Col. Sambo Dasuki (retd), is now facing 47-count charges before three different courts and judges in Abuja. He had previously been docked before a Federal High Court sitting in Abuja on a six-count charge bordering on money laundering and alleged illegal possession of firearms. On Monday, the former NSA was arraigned before Justice Hussein Baba Yusuf of the FCT High Court on a fresh 19-count charge. The charge bordered on alleged illegal diversion of about N32billion from accounts the office of the NSA operated with both the Central Bank of Nigeria and other banks, while yesterday, he was arraigned before an FCT high court on a new 22-count criminal charge bordering on alleged diversion of public funds to the tune of about N13. 6billion. Charged along with Dasuki are former Minister of State, Finance, Bashir Yuguda, former governor of Sokoto State, Attahiru Dalhatu Bafarawa, his son, Sagir Attahiru and a company the EFCC said was used to divert huge sums of money from the office of the NSA prior to the 2015 general elections- Dahaltu Investment Limited. Also charged are Dasuki’s Finance Director, Mr. Shuaibu Salisu, a former Executive Director of the Nigeria National Petroleum Commission, NNPC, Aminu Baba-Kusa, as well as his companies, Acacia Holdings Limited and Reliance Referal Hospital Limited. On the heels of this, and wary of the intent by the former NSA to name top Nigerian leaders who benefitted from funds domiciled in his office, the Presidency last night spoke out on what President Muhammadu Buhari got from the previous administration, apparently to set the record straight and clear his name. Also, the Senate President, Dr Bukola Saraki has blamed the uncovered fraud in the arms probe, during the immediate past administration of Goodluck Jonathan, to the failure of National Assembly to carry out its proper oversight functions. $2.1 billion arms cash: Docked before Justice Ademola Adeniyi, Federal High Court in Abuja on a 6-count charge bordering on money laundering, alleged illegal possession of firearms.